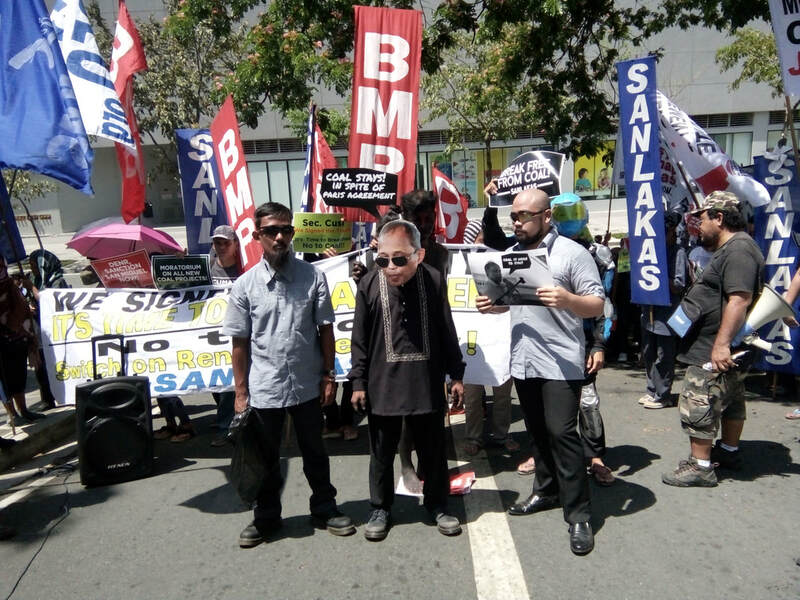 Hundreds consisting of coal-affected communities and civil society organizations marched in front of the Department of Energy to protest its continued support for dirty energy under the helm of Sec. Alfonso Cusi. “Cusi is the clean energy’s number one enemy in the Philippines,” said Atty. Aaron Pedrosa from the multisectoral alliance Sanlakas. “Under his watch, coal proponents and companies see the Philippines as a safe haven for dirty energy, even as this dirty, deadly and costly energy source is being globally abandoned by many countries,” he added. According to the 2017 Boom and Bust Global Pipeline Report, the Philippines is among the ten hotspots for the construction of new coal projects, a deviation from the trend of shrinking support for coal across the globe. Pedrosa noted that Cusi’s problematic policy positions extend from coal to other dirty energy sources. “All available energy options are being considered by Cusi except the right ones,” said Pedrosa, who also heads the Philippine Movement for Climate Justice (PMCJ) Energy Working Group. “Aside from his support for coal, Cusi has also blatantly expressed his advocacy of nuclear power, which carries with it a number of hazards whose effects could prove irreversible for a developing country like ours, like fatal health hazards and environmental degradation stemming from radioactive waste,” said Pedrosa. “The continued engagement of affected citizens are instrumental to changing the world’s energy system,” said Center for Energy, Ecology and Development (CEED) Convenor Gerry Arances. “Last March 20, China has retired its last coal-fired power plant given the public clamor against the environmental cost of coal, reflecting the true status of coal in the global landscape,” he added. Arances noted that it does not make economic sense for the country to insist on coal and nuclear energy, given the drastic decrease in the cost of renewable energy technology. “We urge the President and his cabinet to simply look at the experiences of the community and the real cost of continuing coal operations in the country through an energy audit,” he said. “We are certain that they will find that support for coal at this rate can only be described as addiction,” he noted. “Our protest today at the Department of Energy is part of the global campaign Break Free From Fossil Fuels, demanding governments and corporations to break free from coal and other forms of dirty energy and shift investments to renewable energy. In the Philippines, from Bataan to Cebu, to Davao, we have stood side-by-side with coal-impacted communities to demand from our government to stop their addiction to coal and prioritize renewables,” said Reuben Muni, Climate and Energy Campaigner for Greenpeace Philippines. This year’s Breakfree mobilizations in the Philippines was kicked off by a protest action at the San Miguel Corporation Headquarters with coal-affected communities from Limay, Bataan. These communities, protesting the continued operation of the SMC-owned power plant in their villages, also rattled the gates of the Department of Natural Resources on Wednesday to demand the suspension of the plant’s operations. Communities and civil society organizations from Visayas also took part in nationwide protests against coal with the Climate Walk from Toledo to Cebu City and the unfurling of a massive banner calling to “break free from fossil fuels” in the Cebu City Hall. The groups also directly engaged the Ludo Power Corporation in Cebu with a “No To Coal” floating banner in Cebu City, while various activities from anti-coal groups and communities were also held in Samar & Leyte. “We stand at the threshold of our collective struggle –where every effort to gain ground matters whether it be on the streets in the seats of political power and in the financial sector,” said 350.org campaigner Chuck Baclagon. “The movement to break free will be shifting gear in the following weeks towards challenging the social license of the fossil fuel industry by targeting institutions to divest their investments in dirty energy. Every institution that divests is adding to the pressure fossil fuel industry is feeling, and eroding the social acceptance and political influence of these companies,” he noted.